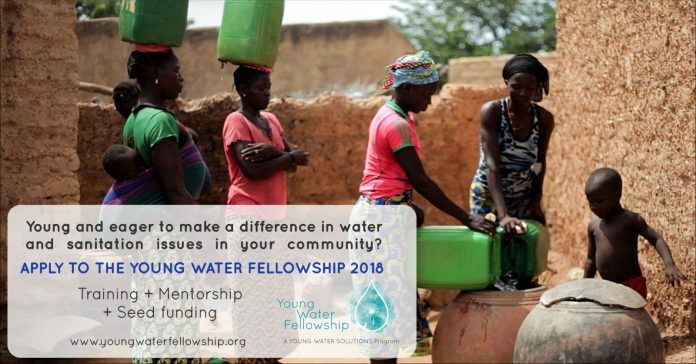 The Young Water Fellowship Program aims to empower young leaders from low and middle income countries to implement projects to tackle water, sanitation & hygiene (WASH), water pollution and water scarcity issues, by offering them an intensive training program, seed funding grants for their projects, and mentoring support by senior level experts during one year. Each year, this program brings about 10 young community leaders capable of successfully designing and implementing sustainable and inclusive water initiatives that significantly improve living conditions in their communities, while contributing to the achievement of SDG #6 (water and sanitation for all). The YWF 2018 will focus on social entrepreneurship. Young people with social businesses ideas (or projects that can be turned into social businesses) that address water-related issues are welcome to apply. Be the founder or co-founder of an initiative that contributes to the solution of a well-defined water problem in your country. The initiative should be in its initial stages and have the ability to be turned into a social enterprise (i.e have a long-term sustainability component or business model). Be a resident from this list of low and middle income countries. All training costs are covered by the organization (flights, transportation in Europe, accommodation, meals), but participants must cover their visa expenses and transport costs to the closest international airport in their country of residency. Be able to communicate in English (intermediate level at least). shared in the application form or sent by email to: applications@youngwatersolution s.org. • Application form: You must fill in an application form answering questions about the initiative and about your own background. You will be asked to upload a short CV anda reference letter. You can download a copy of the questions HERE. Previous articleNatural Resource Governance Institute 2018 Media for Oil Reform Fellowship for Nigerian Journalists. Je suis un passioner en agriculture et l’élevage et j’aimerais approfondie mes connaissances .